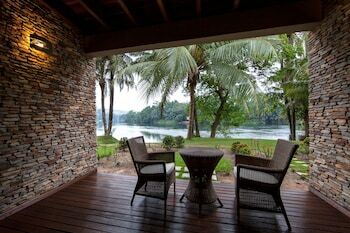 When you stay at The Royal Senchi Resort/Hotel in Akosombo, you'll be 10 minutes by car from Akosombo Dam. Featured amenities include a business center, dry cleaning/laundry services, and a 24-hour front desk. Event facilities at this resort consist of conference space and a meeting room. Free self parking is available onsite. When you stay at Moonlite Hotel Sunyani Airport in Sunyani, you'll be near the airport and 6 minutes by car from Sacred Heart Church. Free self parking is available onsite.